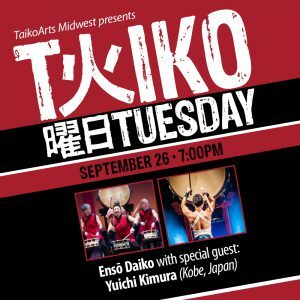 MINNEAPOLIS (Sept. 1, 2017) — TaikoArts Midwest brings the best local and national taiko talent together for a FREE monthly concert series, Taiko Tuesday. The series opens 7 p.m. Sept. 26 in the Concert Hall of the Ordway Center for the Performing Arts, featuring Ensō Daiko with special guest, Yuichi Kimura from Kobe, Japan. Taiko Tuesday concerts promise loud, energetic performances that combine music, dance, culture, and pure athleticism. “So many people I meet have no idea what taiko drumming is, or that we have such a vibrant local taiko community. These concerts are free – an easy opportunity for people and families to give it a try. Plus, our guest artists are some of the best in the world– they are going to blow people away!” says Jennifer Weir, executive director of TaikoArts Midwest. Yuichi Kimura began his professional taiko career when he was 18, and has toured for several decades both within and outside of Japan. His dream is to share Japanese culture and bring the world closer together through taiko music. Ensō Daiko performs traditional and contemporary taiko repertoire, with an emphasis on original compositions. For over 20 years they have contributed to the expanding canon and innovation of North American taiko, and have taught thousands of students of all ages and abilities. Ensō Daiko was founded as Mu Daiko in 1997 by Rick Shiomi, then renamed Ensō Daiko in 2017 by current Artistic Director Jennifer Weir, when TaikoArts Midwest took over the taiko program formerly supported by Mu Performing Arts. Find out more at www.taikoartsmidwest.org. TaikoArts Midwest’s mission is to nurture artistic excellence and deepen and expand the impact of taiko in our community. Inspired by both tradition and innovation, they produce concerts, offer studio classes, lead school residencies, and perform for community and private events. They are the springboard for two resident taiko groups: Ensō Daiko and ensemble-MA. Recently founded as an independent spin-off from Mu Performing Arts, TaikoArts Midwest is Minnesota’s only organization fully dedicated to taiko arts. This concert series, presented by TaikoArts Midwest, is one of the winning projects to receive funding from the John S. and James L. Knight Foundation, as part of the Knight Arts Challenge. In addition to the City of St. Paul Cultural STAR program and the Elmer L. & Eleanor J. Andersen Foundation, this activity is made possible by the voters of Minnesota through a grant from the Metropolitan Regional Arts Council, thanks to a legislative appropriation from the arts and cultural heritage fund.